Difficulty hitting or catching a ball: If your child regularly misses or drops the ball, it’s possible that vision impairment might be affecting hand-eye coordination. This could also be due to a lazy eye, otherwise known as amblyopia. Amblyopia is when one eye is favored over the other, which can affect depth perception, making it difficult to assess objects in front of you. Squinting while reading or watching television: Ask your child if the text or screen is blurry or if reading gives them a headache. 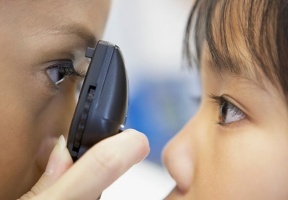 A “yes” answer could indicate an underlying vision problem. Issues watching 3D movies: 3D movies require eyes to work together as a team to process information, so difficulty viewing 3D content can be a sign of underlying vision issues. After watching a 3D movie, look to see if your child feels any discomfort or dizziness, or is unable to process 3D content. Also, watch for digital eye strain, which is caused by prolonged use of computers, smartphones or tablets, and can cause symptoms such as sore, tired, watery or dry eyes, headache, or sore neck, shoulder or back. Help your child practice healthy vision habits by keeping computer screens at least 30 inches away from their eyes; resting their eyes every 20 minutes; and blinking frequently to avoid dry eyes. Practice the 20/20/20 rule: every 20 minutes, take 20 seconds and look at something 20 feet away. Make an appointment for your child now as part of this year’s back-to-school routine. 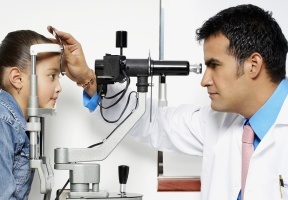 Together with your child’s eye doctor, you can help make sure your child is ready for school and ready to learn.